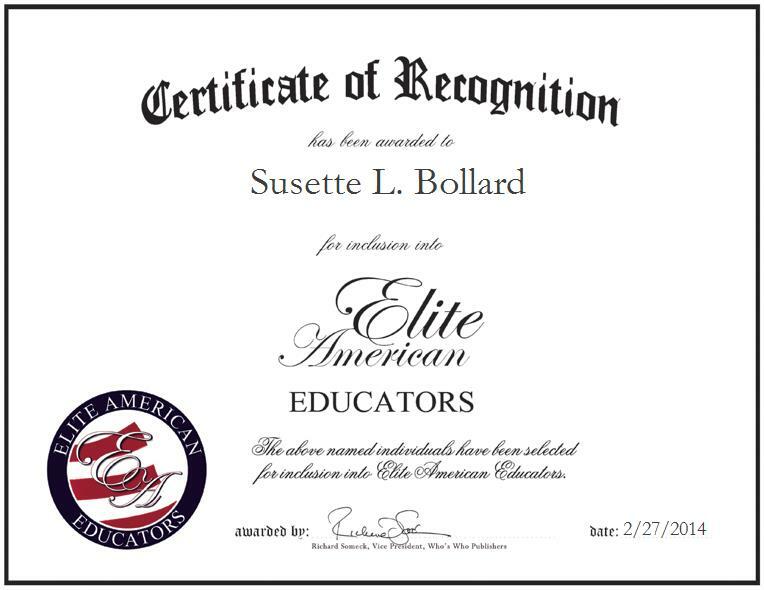 Susette Bollard has dedicated 35 years of service to the education field. She worked as a teacher, teaching music and general education until 1998 when she was promoted to the position of principal. She then became a superintendent, and has served in that position for the Orange North Supervisory Union since July 2007. As the superintendent, Ms. Bollard serves the schools in the towns of Orange, Washington and Willilamstown, oversees curriculum development, and provides quality mentoring opportunities. Ms. Bollard understands that education changes the world, and has thoroughly enjoyed her role in assisting students throughout their academic careers. She attributes her success to her determination and leadership skills. Looking toward the future, Ms. Bollard would like to continue supporting and mentoring principals. She would like to make sure her administrators are well educated in communication and in their soft skills so they can be successful. Ms. Bollard holds a principal mentoring certification, and earned a Master of Education at Trinity College of Vermont, and a Bachelor of Arts in music at Augustana College. She is affiliated with the Association for Supervision and Curriculum Development.